Today's cartoon has a few fun background gags and TWELVE! Secret Symbols so don't miss that particular avenue of amusement. Back in the mid-80s, a friend of mine was at my house one afternoon when he pulled from his jacket pocket a lump of black plastic roughly the size and weight of a brick and began speaking to it as though it were a person. It was one of the first cell phones, which were not yet available to the public and which I'd not even heard had been invented. It sounds ridiculous now, but at the time I was aghast and could not believe he was making a phone call without wires. I've never been one to adopt new technology quickly, so it was still a decade or more before I snipped the strings and threw away the cups I'd been using before that. As amazing as it is that we can now carry a plastic tile in our pocket that provides access to everything in the world almost instantaneously, I do lament the days when you could actually have a phone conversation with someone and they sounded like they were in the same room. The sound quality of modern cell phones is abysmal by comparison; roughly equivalent to what landlines sounded like in the 1950s. Look up anteaters on Google image and tell me they don’t look like somebody’s just been screwing around in Photoshop. 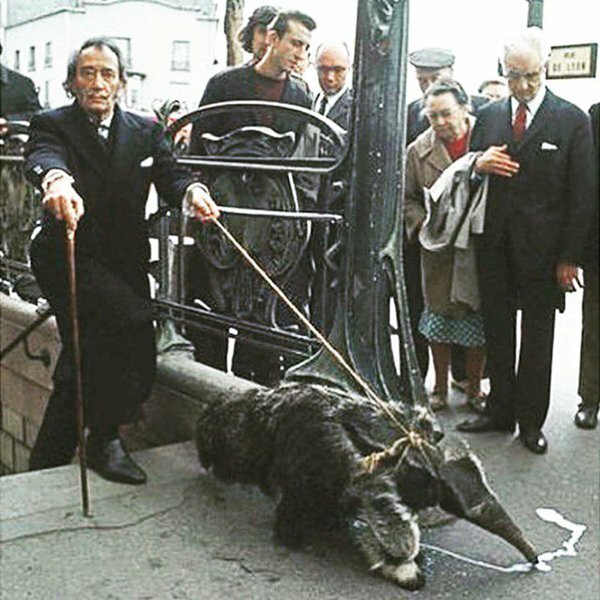 One of my childhood heroes, Salvador Dalí, once walked the streets of Paris with an anteater on a leash. I've no idea if anteaters make good pets (most exotic animals do not, which is why they are not as popular as the species that are commonly kept as pets) but if they did, I might have one. Keeping giant bags of ants around for it to eat might be a challenge, though. One could argue that single-issue voters can be dangerous to the welfare of a country. Anti-abortion voters are partly responsible for the wreck of a human being currently torching the U.S. and the free world, for instance. If, however, there were an Anti-Orange Party, I might sign on. People occasionally ask me if cartoonists have groupies. We do, but they are mostly nerdy men and teenage boys. I only mention that in case any of you are thinking that being a cartoonist is anything like being a rockstar. I understand this guy’s perspective but I’ve seen tons of folks in coffee shops that I definitely prefer would not speak to me. And they don't, probably because I am that same person to them. This cartoon makes me wonder if somewhere there’s a meat-eater pretending to be a vegan eating cauliflower but they’re really eating brains. In spite of what you may have thought at first glance, this is not an illustration of the Trump/Jong-un summit. Although it will likely do about as much good. Real quick, before we're done, here's a watercolor painting I finished this week. I'm not entirely sure what I think of it yet. It's part of my surreal luchador series, which I've been posting on my non-cartoon-art Instagram site. I show a lot of my work in progress, in case any of you artsy types might enjoy seeing the steps between sketch and finish. I hope you'll consider following me. That’s the rundown for this week, Jazz Pickles. Please have a glance at some of our links below that help to keep the campfires burning at Rancho Bizarro. And don’t forget to pop over and see what Wayno had to say about this week’s offerings!